South Africa will not make an official complaint over England's treatment of the ball during the third day's play at Cape Town and the ICC will not take any further action. The hosts "raised concerns" with ICC match referee Roshan Mahanama on Tuesday evening following TV footage that showed Stuart Broad standing on the ball as he fielded it in his followthrough. A South Africa team spokesman said that the matter was now in the hands of Mahanama and an ICC statement confirmed, after the umpires viewed TV footage, that the matter was closed. South Africa had until the start of play on the fourth day to raise the issue as an official complaint, which would have forced Mahanama to launch an investigation. "The International Cricket Council confirms that it has received no official lodgment from South Africa team management laying a charge against any England player following reports of alleged breaches of Law 42.3 (changing the condition of the ball) on day three of the third Test between the two teams in Cape Town," the statement read. "With play on day four of the match having resumed, the deadline for submission of such notification has now passed. In addition, having reviewed relevant television footage, the umpires decided not to bring a charge against any player for a breach of Law 42.3. As such, the ICC now considers this specific matter to be closed. " The incident which sparked the controversy occurred in the 15th over of South Africa's innings when Broad fielded a defensive shot from Hashim Amla by stopping the ball with his boot. Then the TV pictures appeared to show Broad applying pressure with the studs. James Anderson was also believed to have been part of the concerns raised by the home side. "There have been several queries from the media about various video footage shown today, and certain allegations being made about the ball," the South Africa spokesman said on Tuesday evening. "We have raised our concerns with the match referee about it and we've left it to him to decide if any further action or investigation is necessary." However, the England coach Andy Flower said he wasn't aware of South Africa's issues. 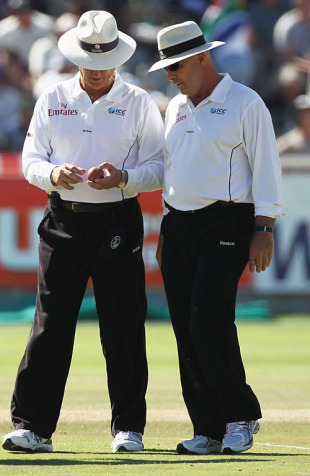 "The umpires or match referee haven't said anything to us about that," he said. "That's the first I've heard of it so I can't really comment." When asked about the specific incident of Broad stepping on the ball, Flower said: "I think over the years we have seen a lot of tall fast bowlers stop balls with their feet so I don't see anything sinister in it all." When play resumed after lunch on the third day the umpires, Daryl Harper and Tony Hill, appeared to have a word with Andrew Strauss, but Flower said he was unaware of any conversation. "It could be all manner of things and I'm not aware of anything. I think it would be wrong to speculate about what they were talking about before we actually know." England have managed to reverse-swing the ball throughout the series, with the most dramatic spell coming on the fourth afternoon at Durban where South Africa fell to 50 for 6, and Flower was adamant it was all down to the bowler's skill. "Without a doubt, I thought they were very skilful in the way they reverse-swung the ball," he said. "We did it a bit at Centurion as well, I think both sides know how to get the ball to reverse-swing and then use it. It's a very well documented skill." This isn't the first time that Broad has been at the centre of controversy during this series. On the third day of the first Test at Centurion he approached the on-field umpires to complain about the length of time South Africa took to ask for a review. He escaped any censure on that occasion but Broad's on-field behaviour has come into focus of late. Sunil Gavaskar claimed in his newspaper column that he avoids punishment because his father, Chris, is an ICC match referee.